Yes, shame on us, we have neglected our NGO website and postponed writing about our creative deeds. It took us a long time to go through the last 6 months to gather info to show you that the last months were not boring at all for us. First of all, let us invite you to a very special event dedicated to those who are passionate about creative writing. 100 de duminici is our free event on the 10th of February, starting at 7 pm at Fabrica club in Bucharest. 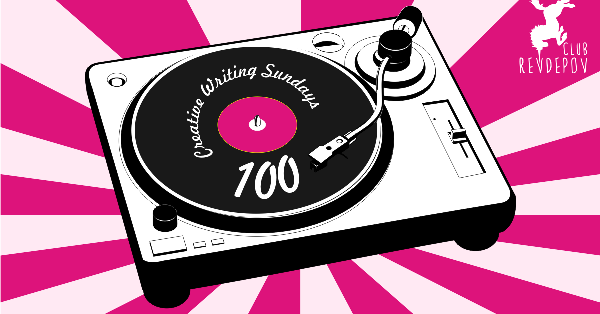 This party (actually, yes, it’s a party) celebrated 100 creative writing meetings in that long standing workshop of ours – Creative Writing Sundays, that started in January 2014 and has brought closer to young writers almost 40 Romanian authors so far. We invited 4 editors who manage book collections dedicated to Romanian authors (Polirom – Adrian Botez, Nemira – Eli Bădică, Paralela 45 – Cosmin Perța and Herg Benet – Alex Voicescu), some of them emerging writers, as we like them. We will have a panel discussing what they are looking for in a book, what are some trends they notices in the local literary community of writers and readers and advice for those who want to see their book published. We will end the event with a concert by a very playful and lovely band – Poetrip. OK, now that we convinced you to come, we can go on with our regular reporting model. We published a few interviews with alumni that recently published books. 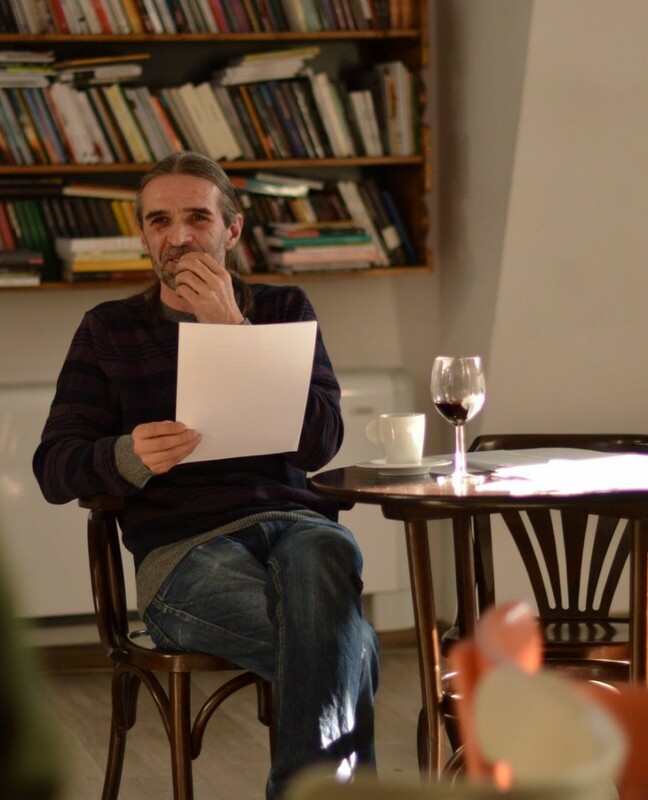 Read on the blog an interview with George Ștefan Niță, who wrote a poetry book, a dialogue with Iulian Popa who recently published a novel and a discussion with Cezar Amariei, who wrote a historical novel. In September, we had a wonderful creative writing workshop at the seaside, but this time the trainer was writer Marin Mălaicu-Hondrari. Marin also had a new edition of the online creative writing workshop were anyone can participate (if the sample text they send us passes the selection process) regardless of where they live. Young writers should have opportunities to become better even if they don’t live in the capital, right? 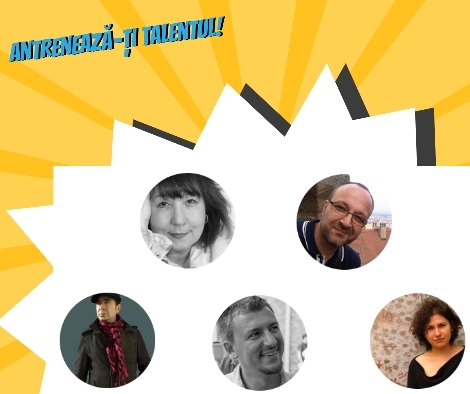 Since July, we had 10 workshops at Creative Writing Sundays, relying on the experience of writers like Doina Ruști, Vasile Ernu, Cezar Paul-Bădescu, Bogdan Munteanu (coming all the way from Timisoara), Maria Manolescu, Matei Florian, Veronica D. Niculescu, Andreea Răsuceanu, Alex Tocilescu and Tudor Ganea (who, as you know, is also our alumnus, who already published 3 great books). What is new is that we created a new format for the poetry workshop and we named it Mornin’ Poets. Andrei Zbîrnea, himself a young poet, helped us organize the first edition. We were honored by the presence of poets like Miruna Vlada , sorin despoT, Svetlana Cârstean, Elena Vlădăreanu, Claudiu Komartin. At the last meeting we had a final beer together and Claudiu came up with the idea to invite the young witers to have a public reading of their poems at an event he will organize this February. Happy to see new opportunities appear for our alumni! As for our calligraphy workshops, we had 5 editions of foundational hand with Another Outsider and 2 of modern calligraphy with Ștefania Iorgoiu. The foundational hand one is now 5 years old, thanks to our alumna Mariana Constantinescu Purice for the Happy Birthday card on her practice notebook! The modern cursive workshop is all about beauty and magic, as you can see below. We had 2 editions of the calligraphy workshop taught by Gloria Popa that aims to correct ugly writing for children aged 9 to 14. 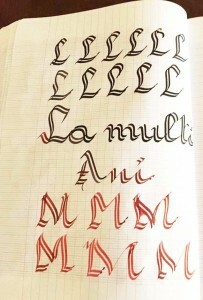 We call it functional calligraphy. 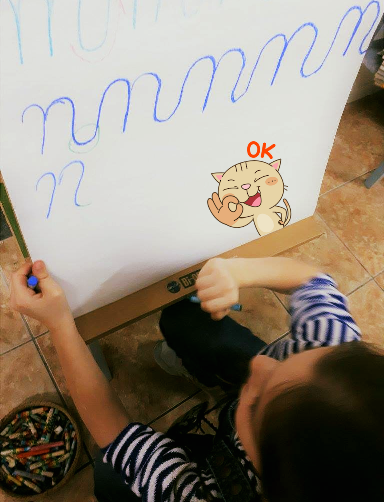 Parents should know that no workshop is enough to improve bad writing that has been going on for years, so we recommend regular practice at home, supervised by a parent who can practice along with the kid, so the child does feel that calligraphy is worth while even for grown-ups. We had two writing contests and published the short stories selected by writers Maria Manolescu and Veronica D. Niculescu. 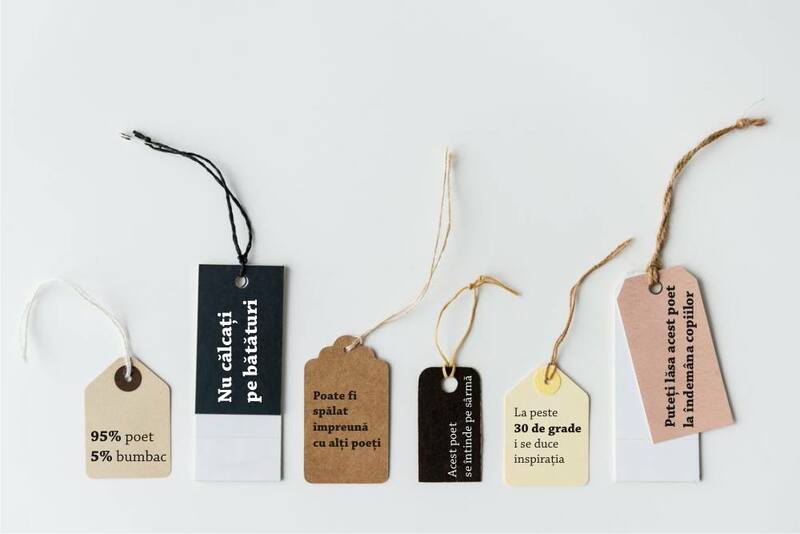 You can read here the stories by the people you see above – Andreea Drăghici, Cristina Chira, Florentina Mărăcine, Iunieta Sandu, Luminita Ion Vilciu and Mihai Balaceanu. We also published, in our beloved Romanian short stories magazine, pieces written during our various workshops. Read them here. 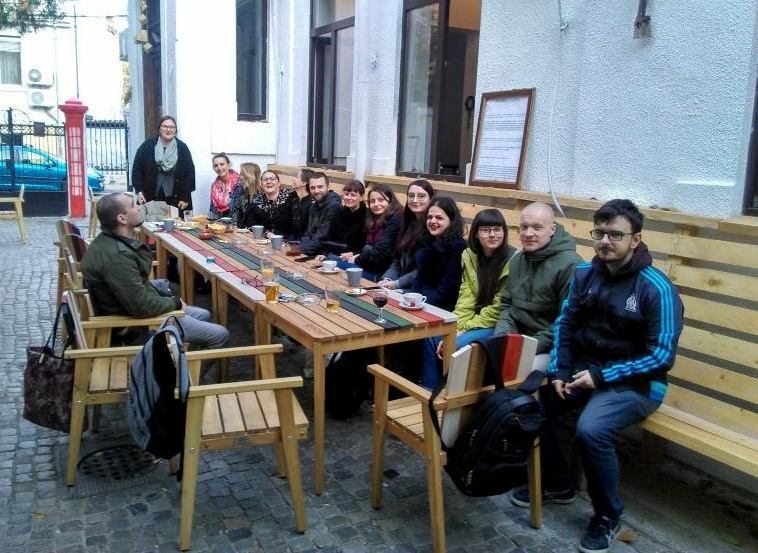 The authors are Laur Cavachi, Traian Stanciu, Simona Sava, Andrada Clonțea, Horea Sibișteanu, Gabriela Anton, Alina Cobzac, Crina Voinaghi, Nicoleta Balaciu, Ruxandra Bancu, Veronica Stan, Ramona Micu, Adelina Butnaru, Allex Trușcă and Andrei Constantin. But guess what? We also started to publish poetry, since we now have a new poetry workshop. Read the poems here. Written by the poets below (for some of them it is obvious from the style of the pictures, really). We contributed to the food and drinks menu of our place of choice when it comes to great atmosphere – it is also the space where most of our workshops take place. Lente invited us to write the beginning of some original stories inside the menu so that people can write along and collaborate to create a complete story. Until now, they have been a little shy, we must say. Simina Diaconu, the president of Brain Fitness, who signed the texts in the menu, was also invited to write a piece in the newspaper printed during the biggest book fair in the country – Gaudeamus. Read it by opening the images in the gallery above. And, finally, it’s that time of the year when we ask you to support our creative NGO by donating 2% of your income tax to us. Get the form here. Thank you!